Anastasia "Stacie" (Soterin) Hamilton, 61, of Lower Burrell, passed away Wednesday, March 20, 2019 at her home after a lengthy illness. She was born May 10, 1957, in New Kensington to the late Peter and Angeline Soterin. Stacie was a 1975 graduate of Springdale High School. She worked as a dental assistant in Natrona Heights. 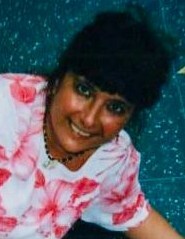 Stacie was a member of Dormition of the Theotokos Greek Orthodox Church in Oakmont. She enjoyed traveling, gardening, singing, cooking and loved music and going to concerts. Stacie is survived by her husband of 42 years, James V. Hamilton,; daughter, Haley A. Hamilton, of Cranberry Township; siblings and by her sisters-in-law, brothers-in-law and nieces and nephews. There will be no public visitation. A memorial service for family and friends will be held at a later date. Arrangements are under the care of the Cicholski-Zidek Funeral Home, Inc. Natrona Heights 724-224-8688. Memorial contributions in memory of Stacie, may be made to the Peoples Library, 3052 Wachter Ave., Lower Burrell, Pa. 15068. To send an online condolence please visit www.cicholski-zidekfh.com.